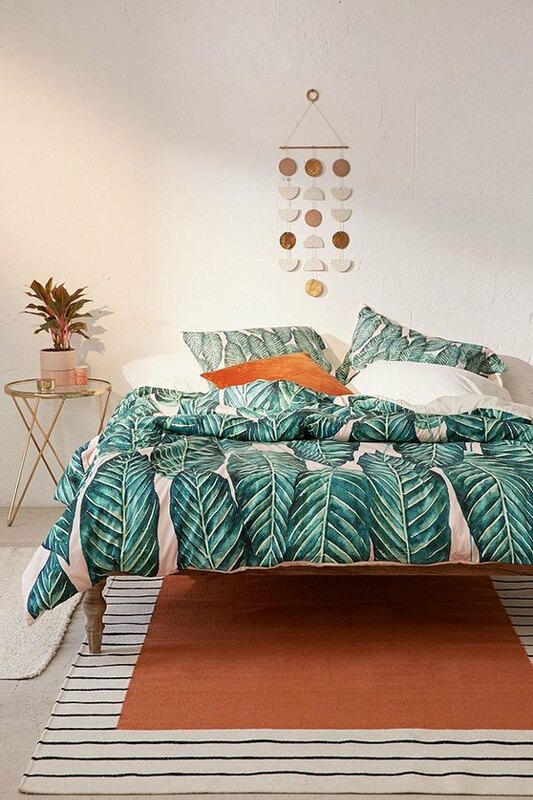 If you're going to give tropical bedroom decor a try, you really just have to go for it! Doing the look halfway won't produce your intended effect. 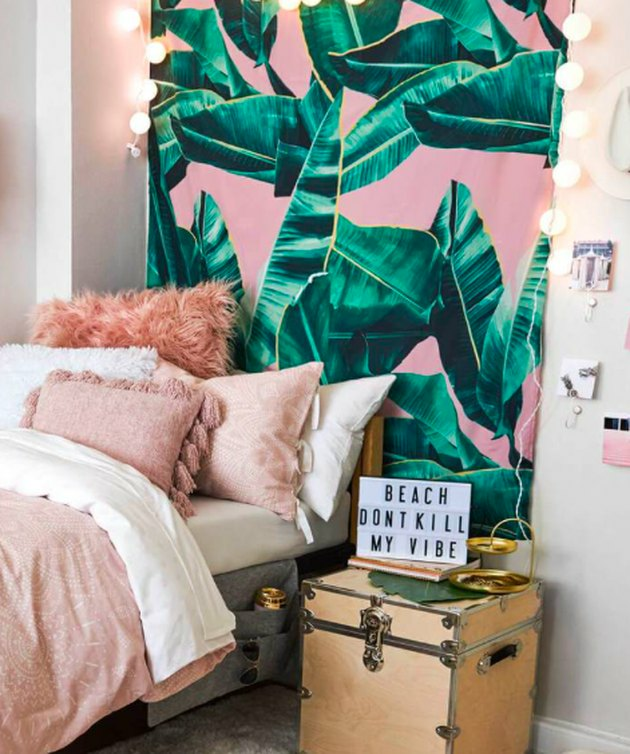 So whether you opt for a tropical accent wall in a large-scale print or a pineapple-shaped hanging pendant light, really embrace the theme and don't be afraid to make a statement. 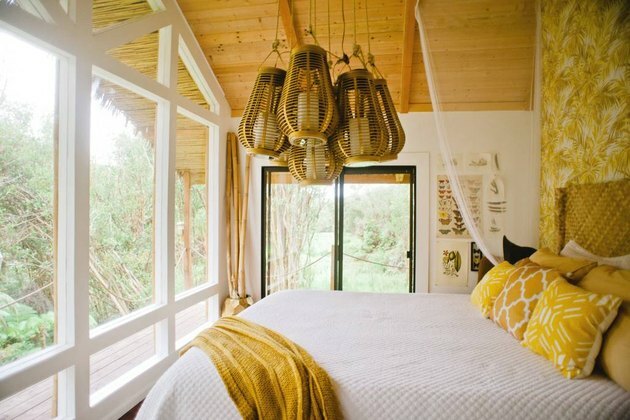 The eye-catching wicker pendant in this gorgeous bedroom emphasizes the room's tropical vibe. And when paired with a rattan chair, light wood flooring, and oversize foliage, the island aesthetic really comes together. 3. Try a tropical tapestry to instantly revamp your space. 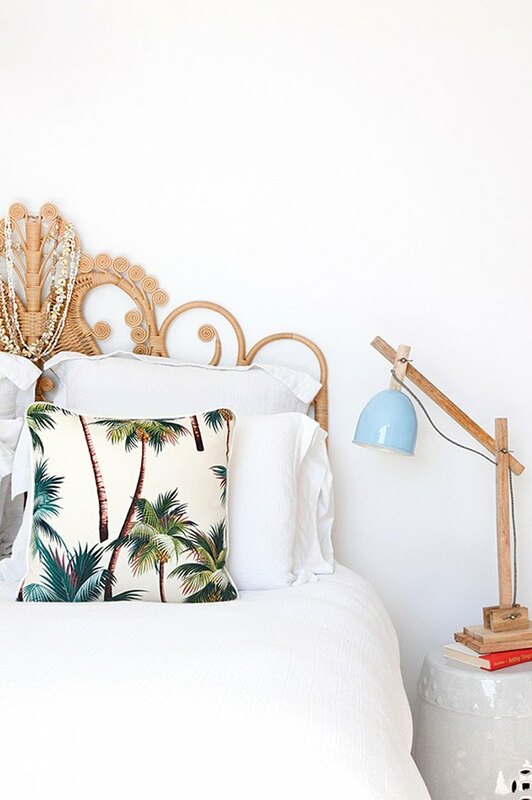 If you're not ready to commit to full-on palm tree patterned wallpaper (... yet), hanging a printed tapestry behind your bed, like this one ( $45 ), or on a blank wall is a great way to create instant island vibes in your space. The best part? It's easy to swap out and update when your style or mood changes. 4. Choose furniture with island vibes. 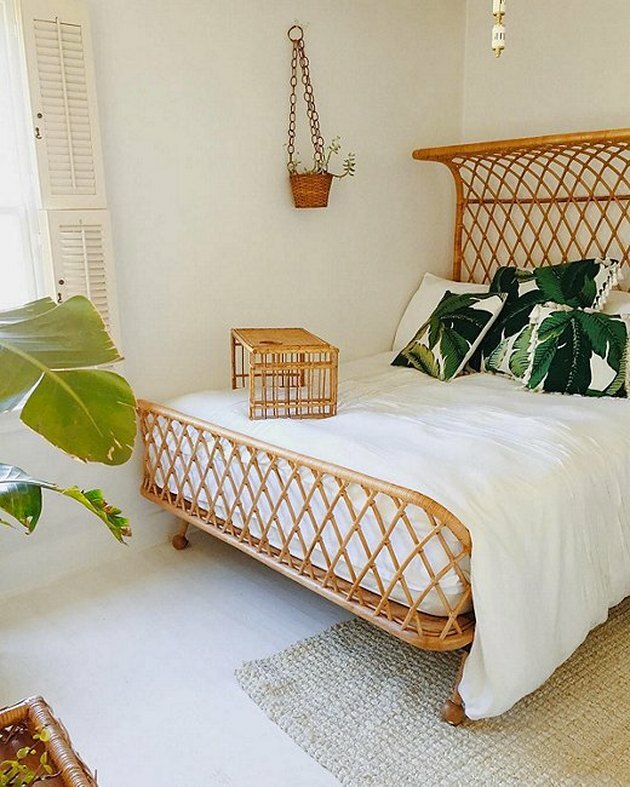 This sunny space in Venice, California features a striking rattan bed frame from Anthropologie ( $1,998 ) that does double duty: It serves as a focal point for the room, while taking its easy, breezy tropical style to the next level. 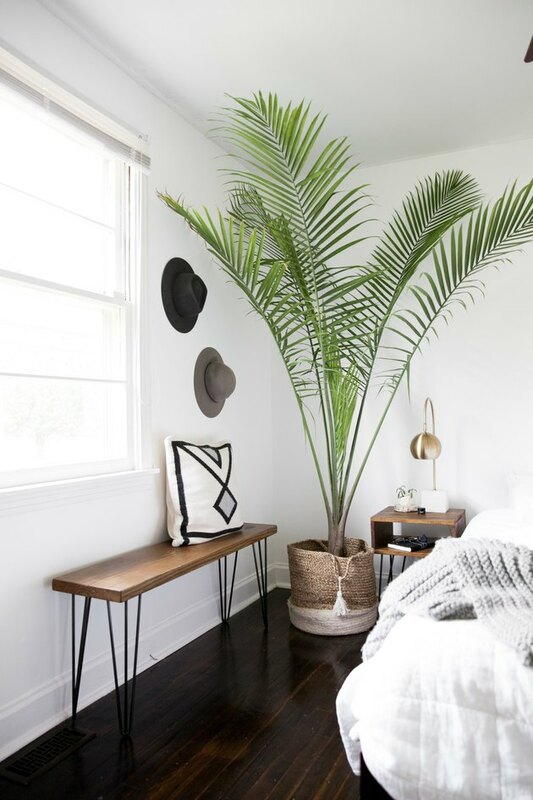 Which is why the rest of the decor — from an oversized plant to a few palm tree printed throw pillows — can be rather minimal. 5. 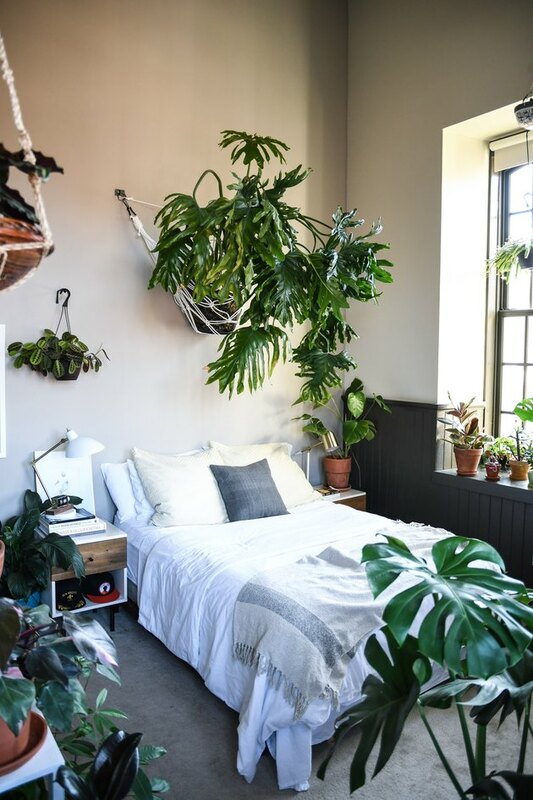 Don't be afraid to overdo it with plant life. 6. Solidify your tropical theme with a statement piece. 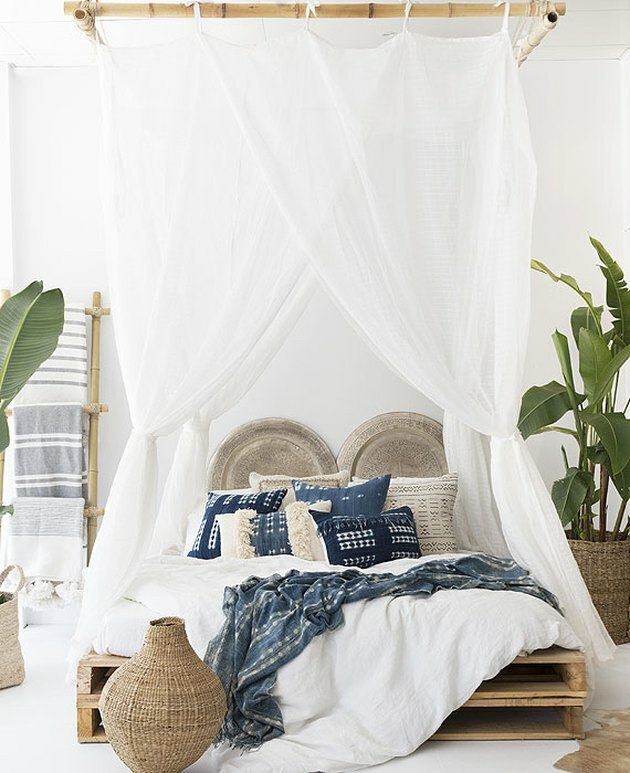 Adding small tropical elements here and there in your space is a great way to start transforming your bedroom into an island oasis. 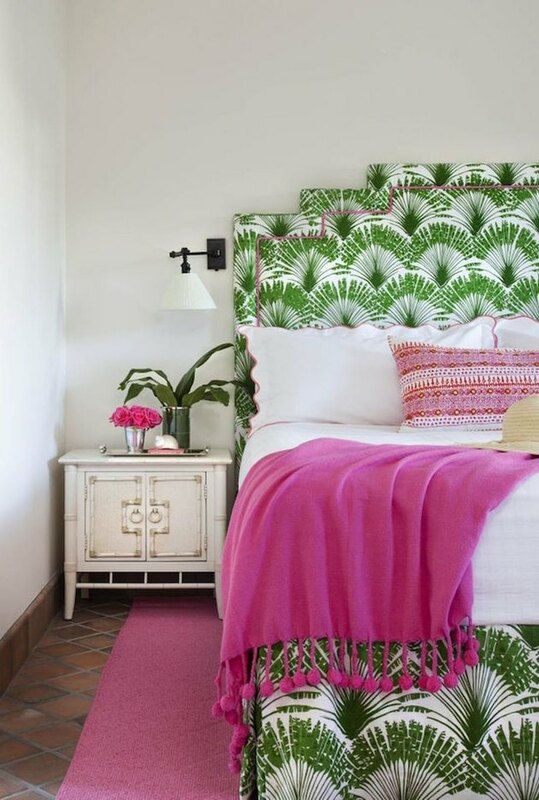 But in order to really drive the theme home, you need to pick one stand-out tropical element to feature — like a gorgeous upholstered headboard. 7. Add lots of interesting decor elements. When you picture the tropics, you probably think of a lush jungle — overloaded with different types of foliage and little critters hiding amongst their leaves — that offers lots of opportunity for exploration. 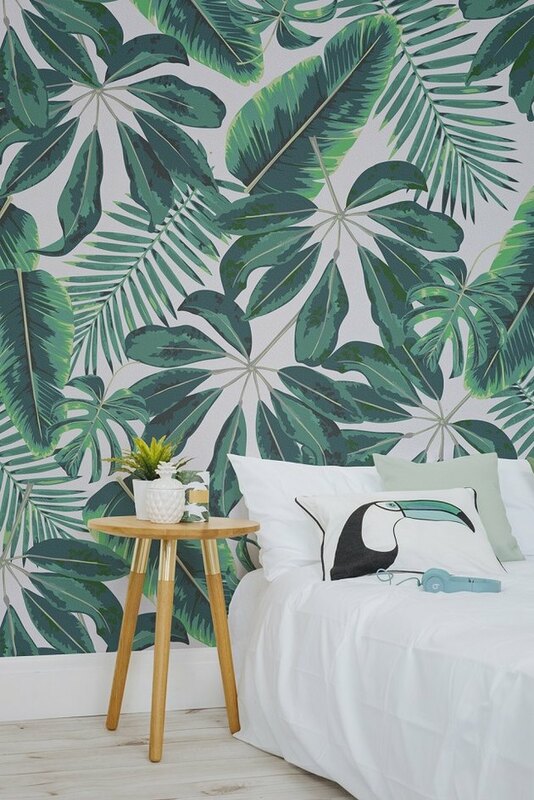 Similarly, with your tropical bedroom decor, pay attention to the little details and extra elements that will help layer your look and make it work. 8. Go beyond palm tree prints. 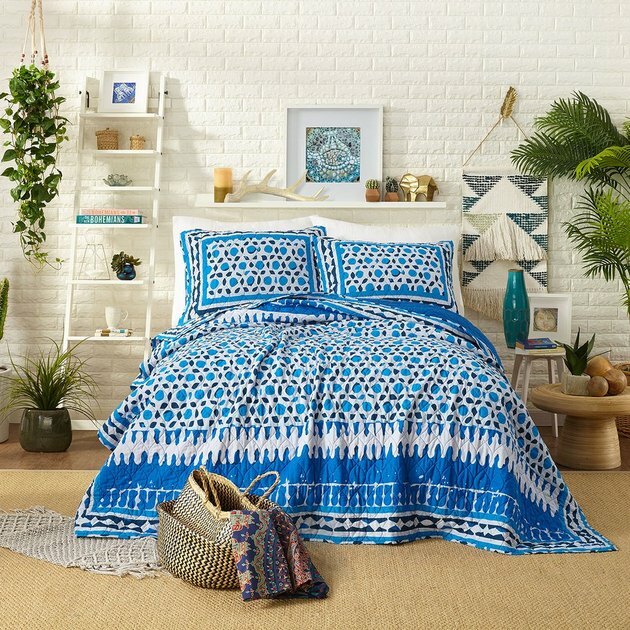 To differentiate your tropic style from the pack, consider trying other coastal-inspired prints and fabric choices beyond the ultra-trendy palm tree print, like Justina Blakeney's Himaya Quilt Set ( $100 ). And then round out your look with .... you guessed it ... leafy, tropical plants. 9. Fill an unused nook or corner. 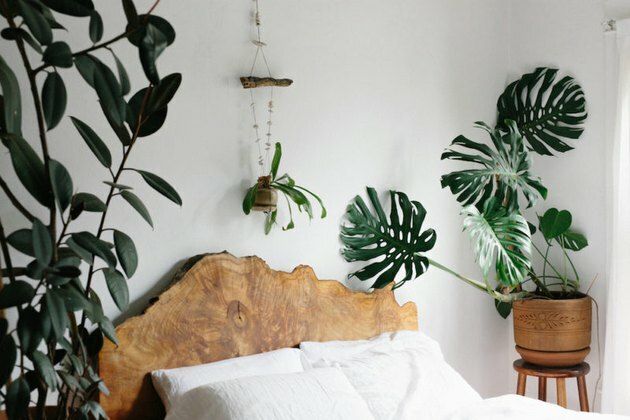 Whether you line your shelves with plants or simply add a cluster of palm fronds to a single corner of your room like photographer Lisa Diederich, more is more when it comes to using greenery to create a tropical feel in your bedroom. 10. Bring the outdoors in. If you're lucky enough to have large picture windows in your bedroom — like this gorgeous Airbnb getaway in Hawaii — let them shine! Skip the window treatments and bring the outdoors in. 11. Interpret "tropical" any way you like. If traditional tropical style is too over-the-top for your minimalist aesthetic, a more streamlined approach might be a better way to go. 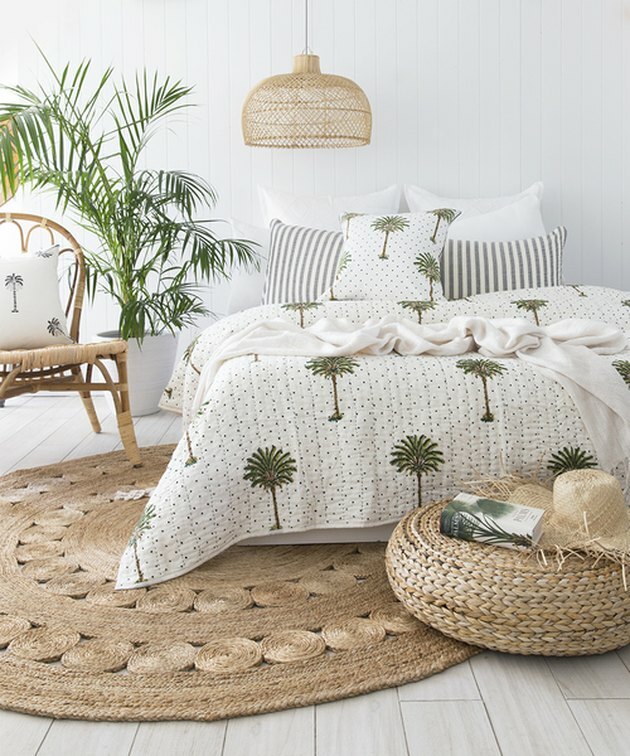 A palm tree patterned duvet and pillow shams from Urban Outfitters ( starting at $129 ) are all it takes to turn this bedroom into an oasis. 12. Add other natural elements, too. Don't forget to continue your boho-chic theme with other pieces of decor, too. A live edge wood headboard like this one can add to the island appeal, but you can also try wicker decor, rattan accents, shells, or sea glass as a way to amp up your tropical style. 13. Use playful pops of color to pull the look together. 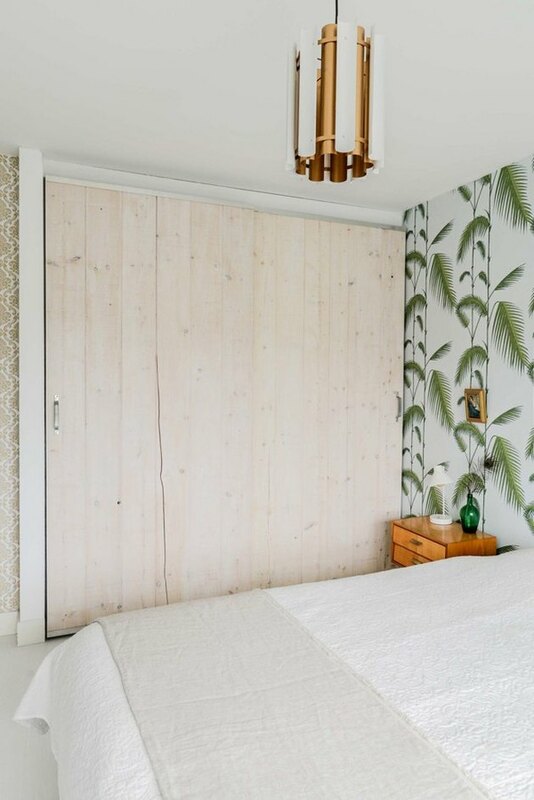 Ashley Rose over at Sugar & Cloth transformed her Houston, Texas guest room into a bright tropical paradise thanks to this palm frond wallpaper. She also added soft pink accents to make the space feel even more cheerful. 14. Tropical style can be minimal, too. 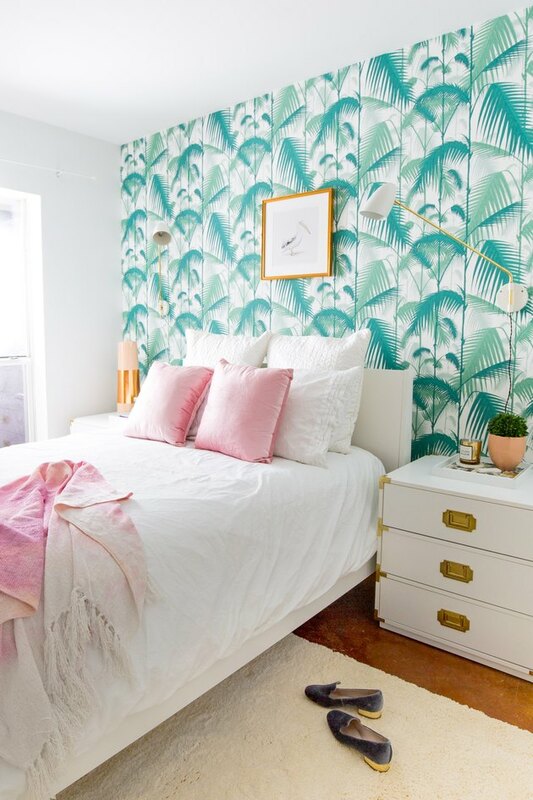 If over-the-top isn't really your thing, not to worry, you can still bring tropical flair into the bedroom — just in a more understated way. Follow the lead of Kirsten, a Netherlands native who blended Scandinavian design with a few subtle island accents (just take a look at that bamboo light fixture!) in her pared-down abode.